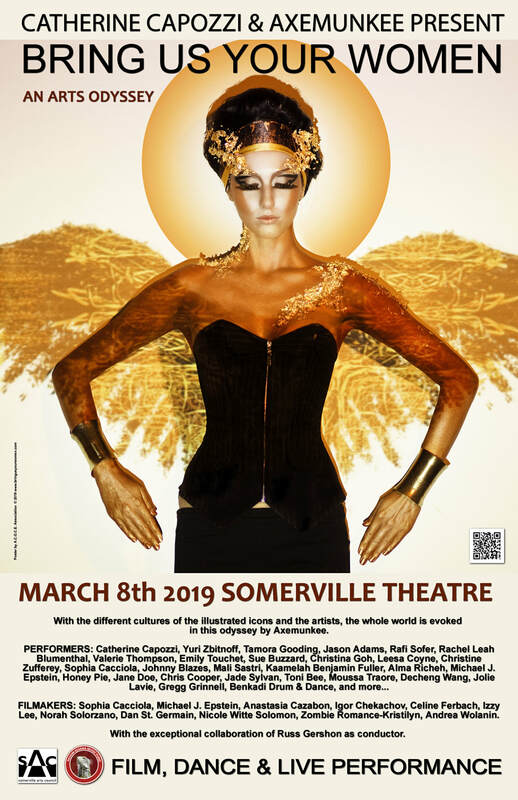 ​Somerville, MA—On Friday, March 8, International Women’s Day will be celebrated locally with global fanfare through Bring Us Your Women: An Arts Odyssey (BUYW) at the Somerville Theatre. This woman-created, multimedia spectacle features performances and works by 40 artists from France, Switzerland, Mali, Côte d'Ivoire, China, Ukraine, Netherlands, and the US honoring diverse female icons. Universal and timeless stories are reimagined through film, music, dance, and poetry. From Eve to Ishtar, Joan of Arc to Kali, and more, these unique retellings aim to inform, empower, and inspire. Bring Us Your Women: An Arts Odyssey is backed in part by grants from the Passim Iguana Music Fund and the Somerville Arts Council, a local agency supported by the Massachusetts Cultural Council. Some material may not be suitable for children under 17. BUYW IS A 2018 GRANT RECIPIENT FROM IGUANA MUSIC FUND CLUB PASSIM AND THIS PROGRAM IS SUPPORTED IN PART BY THE SOMERVILLE ARTS COUNCIL, A LOCAL AGENCY SUPPORTED BY THE MASSACHUSETTS CULTURAL COUNCIL.